14/55 Reagen Sulewski Anti-American only in the sense that it's anti-human, this is a gutshot of a movie that combines Our Town with The Lottery. Lars von Trier, the creator of such impacting cinematic art as Breaking the Waves, The Idiots and Dancer in the Dark (aka the Gold Hearth Trilogy), begins a new trilogy with this think piece on society. Using the backdrop of an small American town in the 1930s, Dogville tells the story of a female fugitive during the Great Depression. When she arrives in the new city, she requests sanctuary and assistance from the locals. In such a tough economy, the citizens are reluctant to help a stranger but they grudgingly do so. A bartering system is developed where in exchange for assistance in harboring the fugitive, the natives require the young woman to follow local customs and perform various acts. At first, the requests are reasonable but eventually they grow to be absurd. The woman's eventual rebellion against these demands is the crux of Dogville. It's a significantly more dramatic take on the central themes of Chocolat. The cast will be the central selling point other than its director. 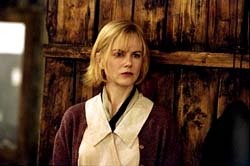 Von Trier wrote the main part with Nicole Kidman in mind and was thrilled to bring her on board as the star. The supporting cast is equally impressive with such notables as Lauren Bacall, James Caan, Patricia Clarkson, Jeremy Davies, Blair Brown, Phillip Baker Hall. Paul Bettany, and Stellan Skarsgaard involved. The production has faced an unusual amount of tribulation. First, Kidman balked at signing a contract for over a month as she considered other projects while recuperating from the knee injury that took her out of Panic Room. Next, a portion of the budget was frozen due to a change of governments before the Danish Film Institute stepped up and secured $1.2 million in funding for the film. Finally, Dogville struggled to attain North American distribution before Lions Gate stepped up. The anti-American ideology espoused combined with the three-hour running time of the final cut made most studios nervous about the uphill battle in mounting a successful advertising campaign. The concerns about releasing such a film during a wave of American patriotism still exist, but the length of the movie is no longer an issue. A shorter version that crops as much as a third of the movie is being released. This savvy decision will also go a long way in driving DVD sales, using the allure of the original cut.